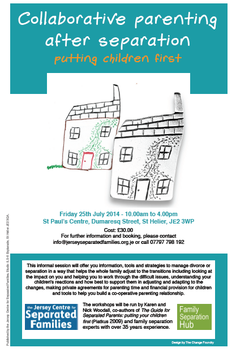 We're delighted to announce that we will be running a collaborative parenting workshop later in July to help parents manage the difficult changes that come with separation. This informal session will offer you information, tools and strategies to manage divorce or separation in a way that helps the whole family adjust to the transitions including looking at the impact on you and helping you to work through the difficult issues, understanding your children's reactions and how best to support them in adjusting and adapting to the changes, making private agreements for parenting time and financial provision for children and tools to help you build a co-operative parenting relationship. 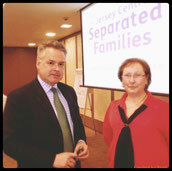 The workshop will be run by Karen and Nick Woodall, co-authors of The Guide for Separated Parents: putting your children first (Piatkus 2009) and family separation experts with over 35 years experience. The event will be held on Friday 25th July 2014 between 10.00am and 4.00pm at St Paul’s Centre, Dumaresq Street, St Helier, JE2 3WP. The cost is just £30.00 per person. For Milli's Child Contact Centre, please click the logo, below.